Typing a character that doesn’t have its own key on the keyboard is easy in Windows – you can just use the Windows Character Map tool. Mac OS doesn’t have a similar tool – or rather, it doesn’t have one that’s so easily accessible. There are a few options for quickly inserting symbols like ®, π and © into a document, though. 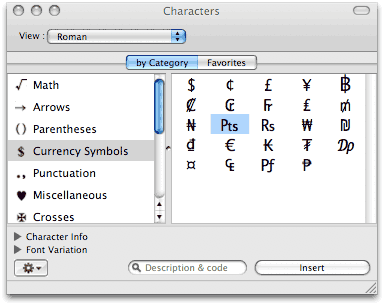 The easiest is to display the Mac OS Characters palette – just press [Command] + [Option] + [T], or [⌘] + [⌥] + [T]. You can then browse through various symbols and special characters, and simply double-click any one to insert it into your current document. A quicker option is to use the OptionAlt Widget. Once installed, this displays a keyboard map with all keyboard-accessible characters and symbols. It doesn’t show as many symbols as the Characters palette, but most of the commonly used ones are there and it’s a handy option if you want to memorise the three or four you use regularly. Posted in: Apple, How to, Keyboard shortcuts, Mac OS.